With garage door repair scams springing up around the country, and even in the Lubbock area, we wanted to make sure homeowners have a good understanding of the types of common garage door repairs and how to easily diagnose them. We also want to give you a general idea of what you should be paying for each of these repairs. It’s important to have a general understanding of home repairs and costs so you don’t get pressured into paying more than you should. Should I have a professional fix my garage door? There’s many home repairs that I would say to go ahead and DIY, but fixing the garage door isn’t one of them. It’s important to realize the benefits of having a professional come and fix your garage door system. Having your door professionally repaired is definitely worth the cost. A professional door technician can ensure the necessary repairs have been done correctly and make sure your garage door system runs smoothly and efficiently. A broken garage door spring is a very common garage door repair. Replacing a broken spring is something we always recommend being done by a professional. Springs are under incredible amount of tension and can be very dangerous to install if you don’t know what you’re doing. Springs also have to be wound with special tools, because of this, it’s important to call a trained garage door technician to replace it. If you need spring replacement, give us a call today. 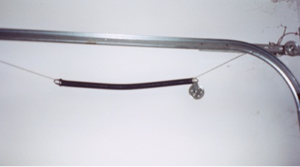 There are two types of springs on garage door systems, torsion and extension springs. If either of these springs break, you should easily be able to notice it. 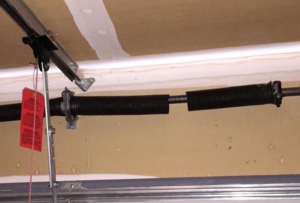 If you want to know if your torsion garage door spring is broken, look towards the inside top of your garage door. Garage doors have either one or two torsion springs on both sides of the door. You can see from the picture below that the torsion spring on the right side has snapped. If you see this then it’s time to call a professional to replace your spring. When extension springs break, the springs that extend from the garage door to the opener, you’ll usually see a spring hanging from the tracks of your door. How long should a garage door spring last? Garage door springs will typically last 5,000 to 10,000 cycles. One cycle is equal to you opening and closing your garage door once. If you use your garage door as the main entrance to your home, then chances are your garage door springs will break sooner than someone who doesn’t use their door as often. How much does a garage door spring replacement cost? A torsion spring will cost anywhere from $60 – $70 to purchase and to have it installed by a professional garage door company should cost you around $140 to $155 for one torsion spring replacement. If you have two torsion springs on your garage door that need replacing, the total cost for installation should be in the range of $220 – $240. The price for one extension spring should cost around $30. To have a professional install your extension spring should cost from $100 – $120 for replacing one extension spring and around $130 – $150 to replace both extension springs. The cables on a garage door are attached to the bottom bracket and are coiled around a cable drum for garage doors with a torsion spring. For garage doors with an extension spring. The cables are attached to the bottom bracket, go up over a pulley and then go through a pulley on the extension spring. You’ll also have a cable going through the middle of the extension spring, which keeps the spring from flying across your garage if the spring breaks. The cables help to lift your garage door, without them your garage door system is incomplete. Cables are under high tension, so it’s important to call someone who is experienced to fix the broken cables on your door. Garage door cables cost around $15 each and $30 for the pair. We recommend getting cables installed or replaced by a professional door company, so you would include the service/installation fee. The total amount you should spend on replacing cables should be in the range of $90 to $115. How to tell if my garage door sensors aren’t working? Another very common problem is malfunctioning garage door sensors. There’s a couple of names for these very helpful and required security features you’ll hear when contacting garage door companies. They will be called photo eyes, sensors or safety beams. These photo eyes work by using an infrared beam, which keeps the door from closing if an object passes through them. To see if your sensors are causing you garage door issues, the indicator light on them will be flashing. If this indicator light is not flashing, chances are there isn’t an issue with your sensors. If your sensors are flashing, here are some common issues. If the sensors are not aligned, it will cause your garage door to not function properly or cause it to not operate at all. In this case, the sensors will need to be adjusted until the flashing light turns solid. If there’s something obstructing the beams like leaves, it may keep your door from operating. Clear any debris or obstructions from the pathway of the door and then try operating your garage door. Also, if dirt gets on the photo eyes, the system may think there is an obstruction in the pathway of your door. Make sure sensors are clear and clean, then try operating the door. If none of this works and it seems your sensors are working properly, call us to get a professional to diagnose the issue. The cost to fix malfunctioning sensors usually won’t cost more than a service call fee, which can range on average from $75 – $85. If you’re needing to replace your garage door safety sensors they should cost around $85 – $95 and if you want them installed by a professional, then the total cost will be around $170. Why isn’t my garage door remote not working? When a garage door remote isn’t working it’s usually simple to diagnose. If it’s only one remote that’s not working, first try replacing the battery. If you find it still doesn’t work after replacing the battery, give us a call to help diagnose the problem. It could be a programming issue, or you may need to purchase a new remote for your garage door opener. The price for a new garage door opener remote depends on the type you get. Remotes range in prices from $30 – $50. A loud garage door is another common problem we hear about. This problem can most often just be solved by spraying your doors hinges, brackets, and springs with a lubricant spray. Spraying your garage door regularly with lube is a great way to keep your door maintained and running smoothly for years. If greasing up your door components doesn’t help, then you may need to replace a part on your garage door system. We are fully stocked with all the garage door parts you may need. To have someone come out to look at your garage door it will cost about $75 – $85 plus any parts that you may need. If all your needing is a lubricant spray for your garage door, then it will cost you around $12 per bottle. If you’re garage door opener isn’t working at all then it could be that you need a new circuit board. This is a job that’s best done by a professional. The cost for the circuit board including installation should be in the range of $165 to $175. If you need new rollers for your garage door, expect to pay around $10 each. You can expect to pay around $15 each for a new hinge on your garage door. A well-maintained garage door opener should last 10 – 15 years. This depends on how often you use your garage door, the brand you buy, and the reliability and construction of the opener. Also, take a look at the Overhead Door Corporate website, where you’ll find a four part series on protecting yourself against scammers in the garage door industry. The first blog goes into, “How Consumers Fall Victim to Garage Door Scams“. This article will teach how to identify “red flags” in a garage door companies advertising. The second blog goes into “The Four Common Reasons Your Garage Door May Need Service and Repair“. The third blog of this series dives deeper into shady marketing and sales tactics of garage door repair scams. In the fourth part of the garage door scam series it will let you know what questions to ask to make sure you’re working with a reputable garage door repair company. Also, here’s some helpful tips to make sure you are working with “The Genuine. The Original. 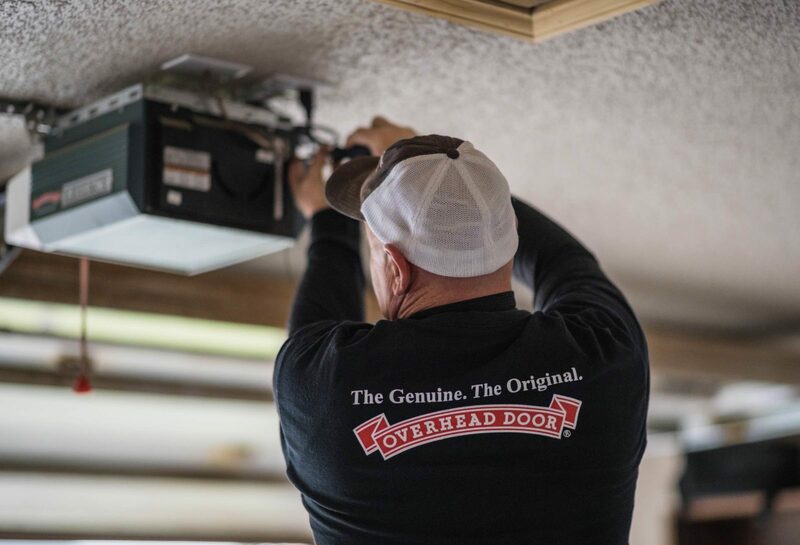 Overhead Door Company of Lubbock”. *The prices listed above are an average. Prices may vary depending on the extent of the job, location of the job, and other factors. *Please note that depending on the region you live; garage door repair prices may vary. These prices are intended to give consumers a general idea of the cost of garage door repairs and do not reflect actual prices of these services.